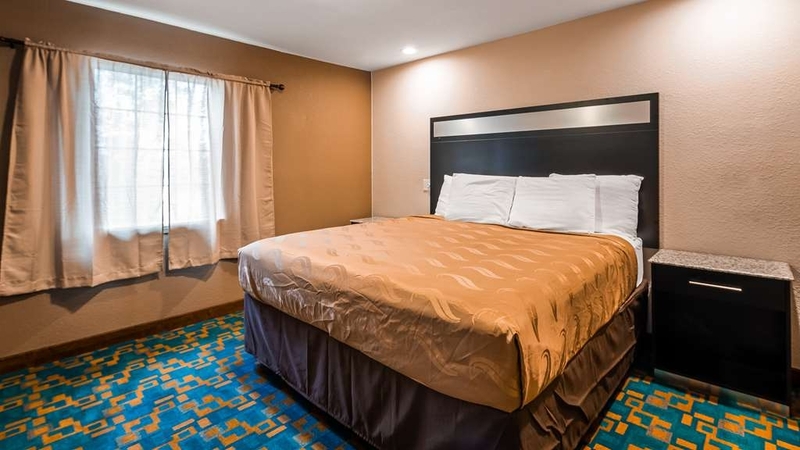 The SureStay Hotel by Best Western Brownsville is ideally located in the center of Brownsville. Come and experience our hotel near the major tourist attractions. Best price guaranteed and exclusive deals. 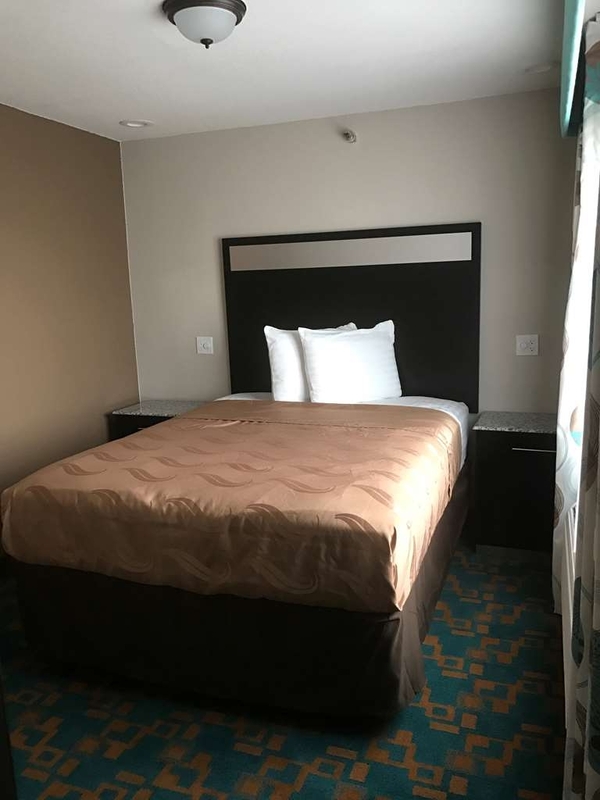 Welcome to the SureStay® Hotel by Best Western Brownsville! We strive to exceed your every expectation starting from the moment you walk into our hotel. We look forward to your arrival in Brownsville. Indulge yourself in our warm, welcoming and inviting king or king mobility accessible bedrooms. 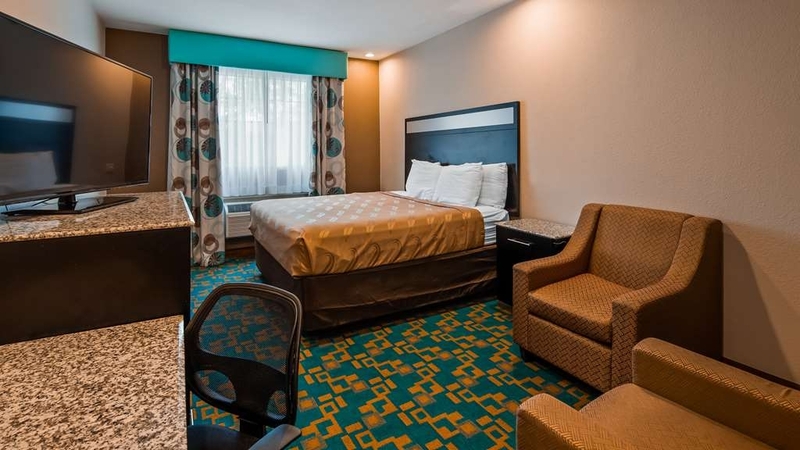 This king suite is perfect for a layover, extended stay or weekend getaway. 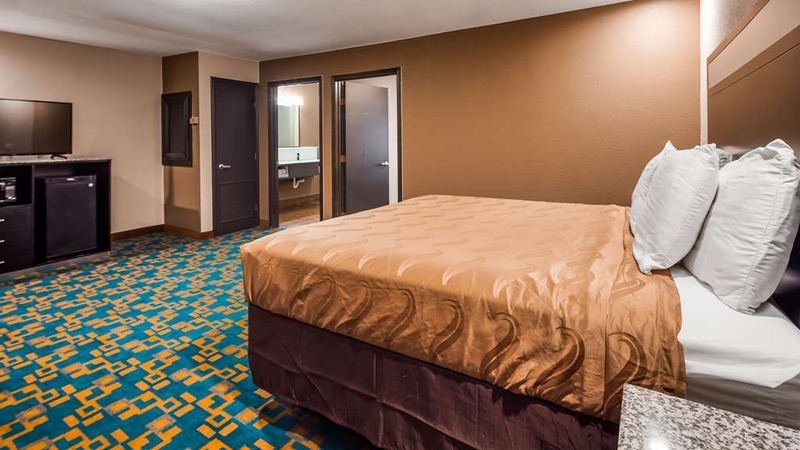 Make yourself at home in our king suite featuring 2 rooms with a microwave and refrigerator. Designed for corporate and leisure traveler alike, make a reservation in this room with two queen beds. 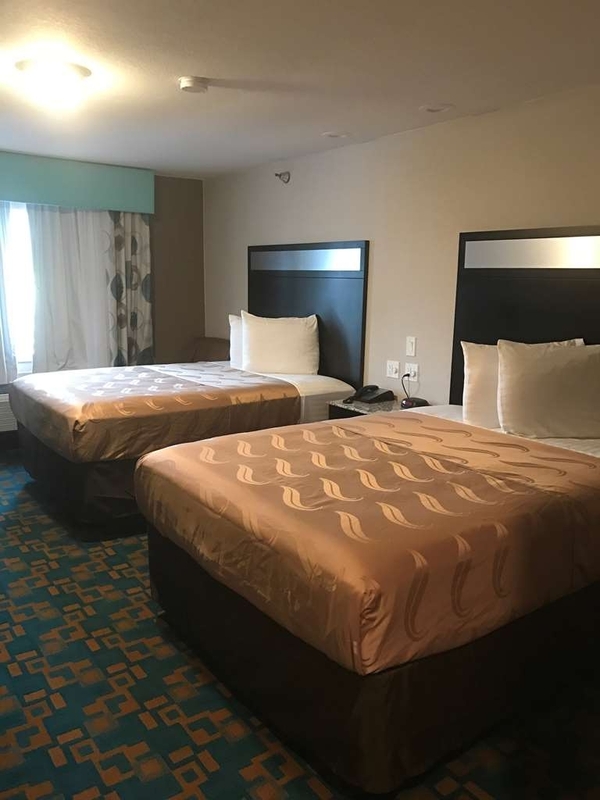 If your traveling with your family make a reservation in this 3 queen bedroom. 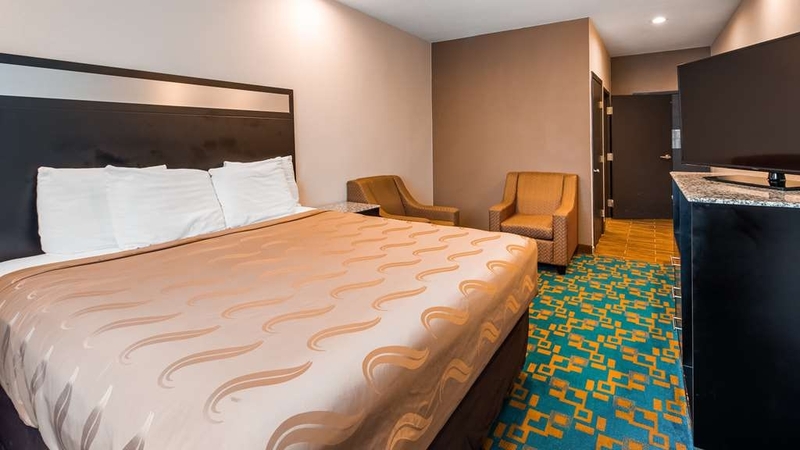 Stretch out and relax in the guest room with three queen size beds. This 3 queen bedroom offers a microwave, refrigerator and flat screen TV. 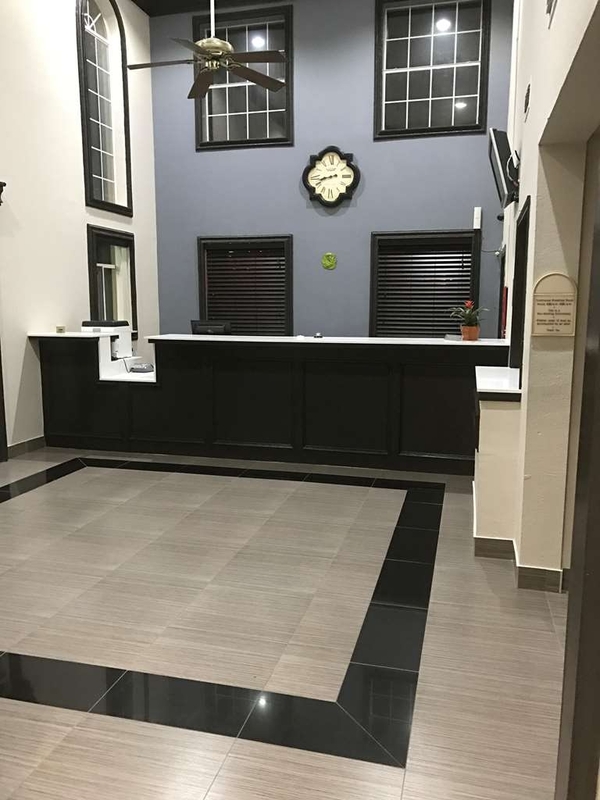 Thank you for choosing the SureStay Hotel Brownsville. 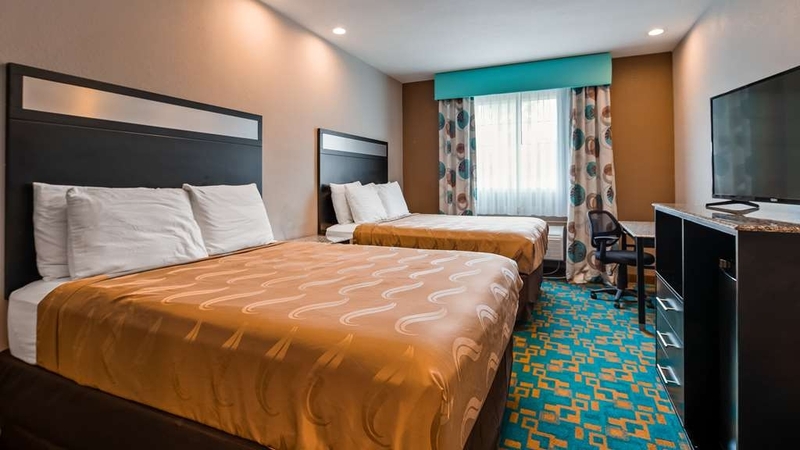 Our hotel offers a continental breakfast, free Wi-Fi, a business center and a swimming pool. 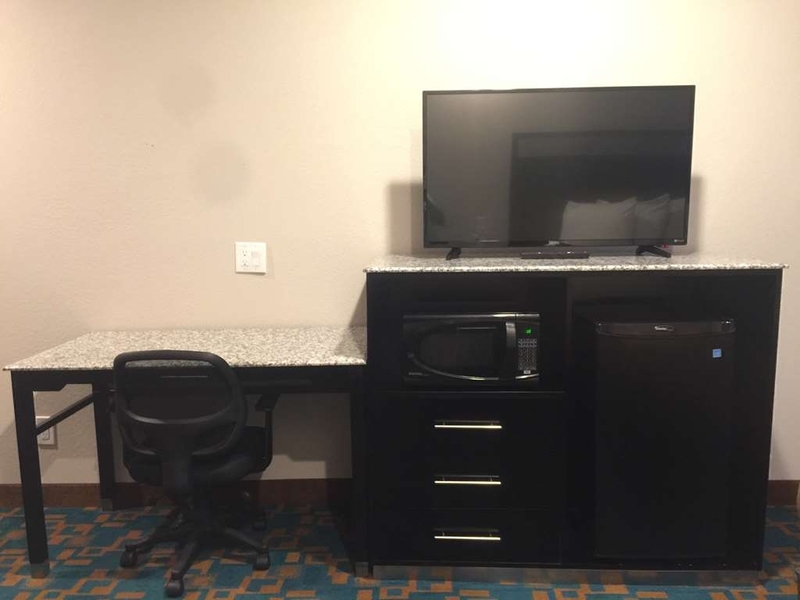 Our rooms are equipped with a Smart TV, mini-fridge, microwave, coffee maker and an alarm clock. Enjoy your stay! This was a tough review to write. If I could separate the staff from the property, I would give the customer service 5 stars and the property 2. This is an older property that seems to be in the middle of renovation. As several people mentioned, there is a musty smell that is worse than the average hotel-near-water smell. We arrived late in the evening and were assigned to a room that had non-functional outlets and the lighting was just weird. There are no bedside lamps in the rooms, just can lights in the ceiling over each side of the bed. We asked for a different room so we could charge our phones and this room also had bizarre lighting. No art on the walls, no bedside lamps. Towels were very thin. Breakfast was the standard continental breakfast - you can guess the menu and 99% of you will be spot on. Again, the staff working the desk were super friendly but this property is smelly and absolutely bare-bones. For sub $60, it's worth it but I would never pay more. "Yuck!! Dirty Bed sheets and pool, bad breakfast"
Worst stay ever! We normally always stay at Best Western,a Hilton hotel, or Stay Bridge Hotel since we enjoy the suites but this was the worst suite ever!! Room keys didn't work after 6 different sets, bed sheets in 2 out of 3 beds where dirty, stained and uncomfortable, pool was dirty and black at the bottom, shower water pressure sucked and the breakfast was horrible! So disappointed! We planned to stay another night but checked out instead. We reserved a two bedroom suite three months prior to our stay. We were checked into a room without a functional air conditioner. Maintenance stated it had not been working for several days. We requested different accommodations and the manager tried to charge us more money. We stayed three days and two nights and neither room received maid service during our entire stay. The process to obtain clean towels involved 20 minutes and multiple trips to the front desk and laundry room. Housekeeping stated our “do not disturb” sign was out, but that was not accurate. Much of the hotel has an unusual smell which they try to mask with plug in air fresheners. The front desk was unoccupied most of the time. 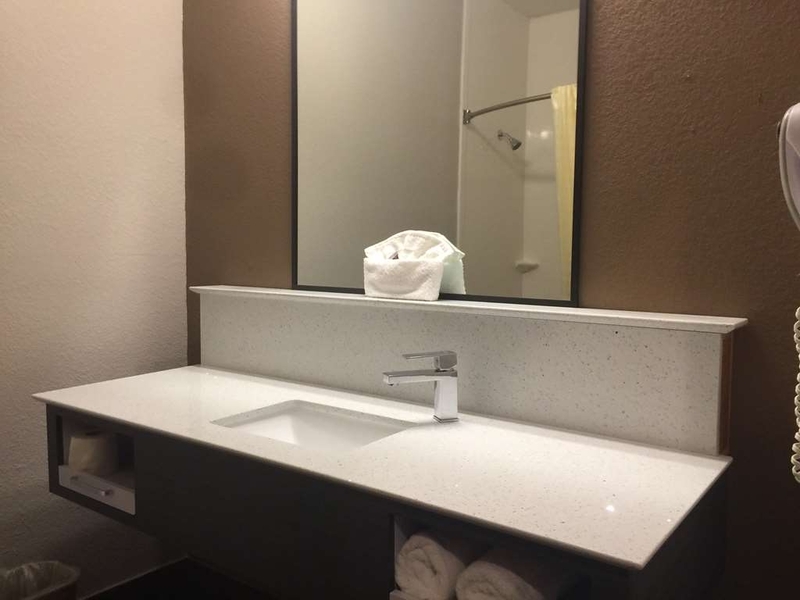 Recent upgrades are apparent but some design features do not make sense like the faucet in the corner of the sink that you cannot get your hands under. Nasty central air closet, unfinished patchwork on the bedroom walls, missing rod for the toilet paper roll, dirty diaper on the non-functional water fountain, bad tasting water, and the list goes on. Best Western corporate should consider auditing this facility. Simona and Derek gave exceptional service from our arrival to departure. Willing to help, answered all our questions. Great personality. The breakfast was hot, fresh, and there and a lot of variety. We would stay there again. I was in Brownsville for three weeks on a business trip and I stayed at this Sure Stay for the duration of my trip. I thought that Simona and her staff were excellent. I had a lot of fun while I was a guest here. 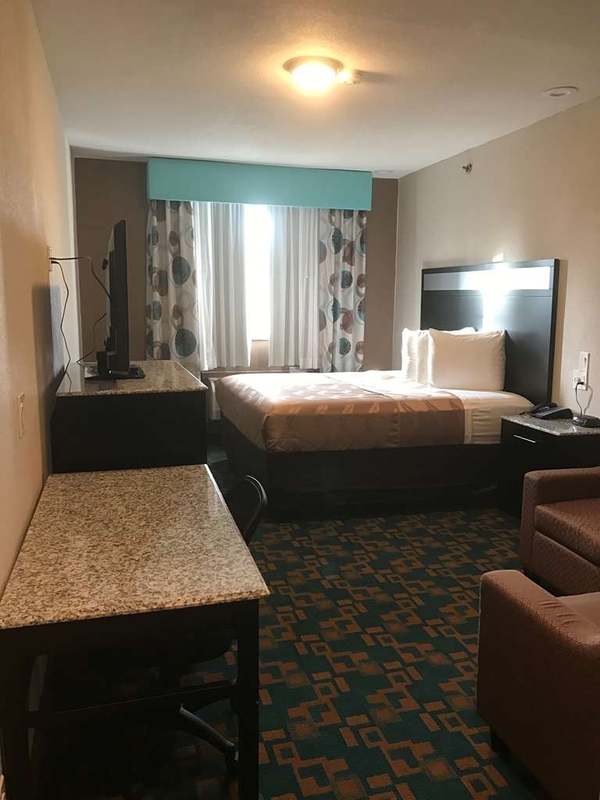 The hotel was exceptionally clean, the rooms are very large and comfortable, the TV station selection was excellent, and the breakfast was always on point! S Padre Island is only about 30 minutes away from the hotel. I'll be back. I spent three nights here while visiting my daughter. The hotel is located in an older part of town, it appears to be a remodel of an old hotel. The staff was friendly, rooms were good size BUT the mildew smell was sooo strong, I considered going somewhere else. After three nights everything I had smelled of mildew, as you can see in the picture there was mold on the curtain above the air conditioner. I realize it is extremely humid there but I have stayed at other places and did not have this issue. 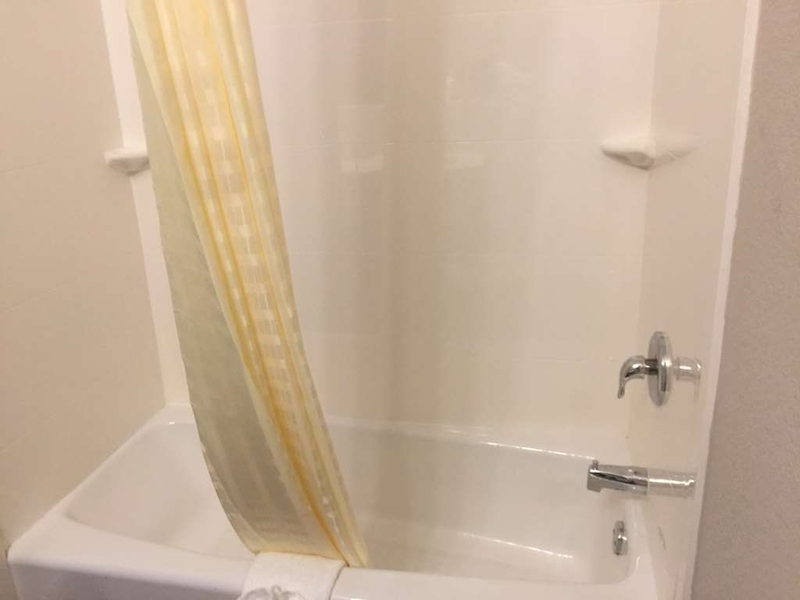 The amount of mold on that curtain can not be healthy, and why they didn't clean it or replace it shocks me! I won't stay there again. "Total confusion - not impressed"
As a BW Gold Rewards member, I had to remind myself that the Sure Stay is definitely the D-League among the BW, BW Plus, and Sure Stay family of properties. For starters, nobody at the front desk when we arrived, had to find somebody. Bare bones cable choices. No Espn, no hbo, probably a dozen Spanish channels and about 6 English speaking channels. No Ice machine (had to go to the front desk to get ice). My second night, came in after work, housekeeping had not been there at all. So I thought, probably just an over sight. About that time another guest entered my room with a key he had just gotten when he checked in. He apologized and we went up to the front desk together. Their computer didn't show anyone in room 124, even though my reservation was originally for two nights. That's why housekeeping never came because they thought nobody was in the room. So they made me go through the entire registration process all over again. My job was held over, so I extended my stay an extra day. Came in after a 16hr day in the hot sun only to find my room key didn't work. Back to the front desk again. No explanation from them, they just acted like it was a normal occurrence and reprogrammed my room card. 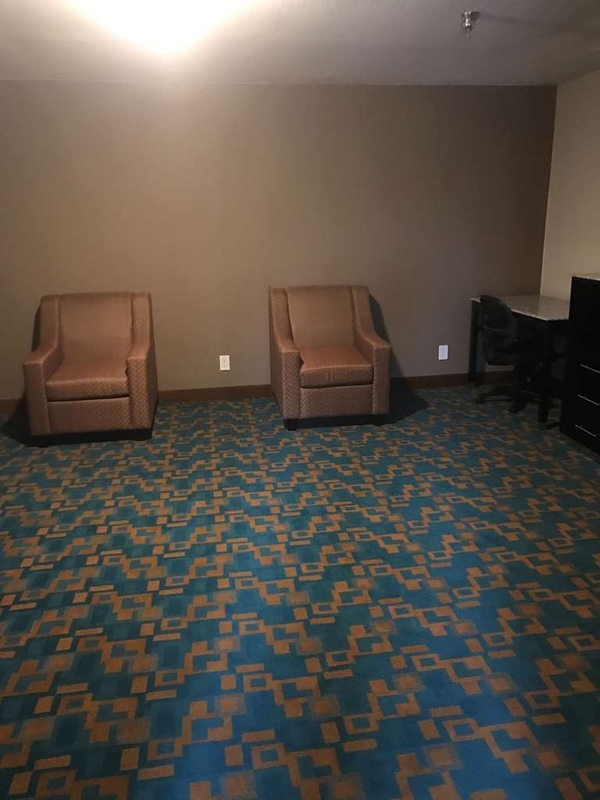 Although they had made the bed and replaced the bathroom necessities (except the coffee), the carpet had not been vacuumed. It wasn't until the last morning (3 nights, and 4 days) when I was checking out did the site Mgr ask if everything was ok? 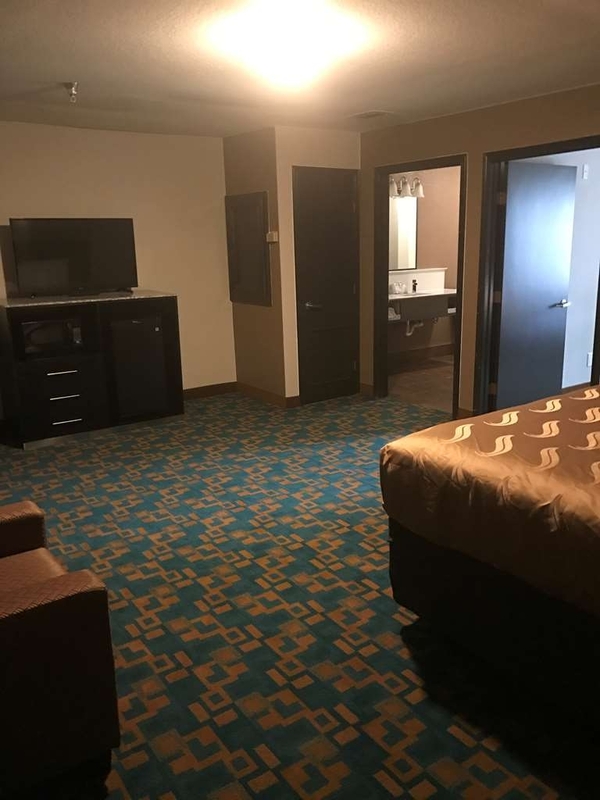 I had a totally different and better experience at a Sure Stay in Beeville, TX (better cable, Ice on every floor, replinshed everyhing in the rooms everyday). So I don't this level amenities is indicative of every Sure Stay Hotel, I just think the level of attentiveness & amenities I received at the location in Brownsville, TX leaves a lot to be desired. I will probably try a different chain the next time I visit Brownsville. The hotel was very nice. 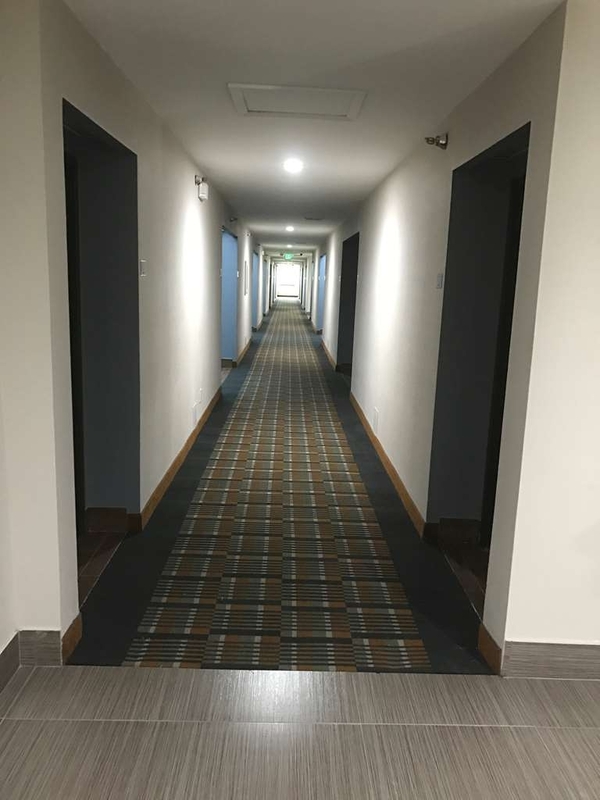 The hotel is very new, not on Google Maps. The staff was very friendly and helpful. The location was great; it was near the Zoo and downtown for the Charro Day Parades. We would stay there again. this hotel is very clean,safe!and manager (Simona) is very good! i want to choose this hotel. continental breakfast is great, no eggs or bacon but the texas waffles are awesome. the beds are awesome.?? 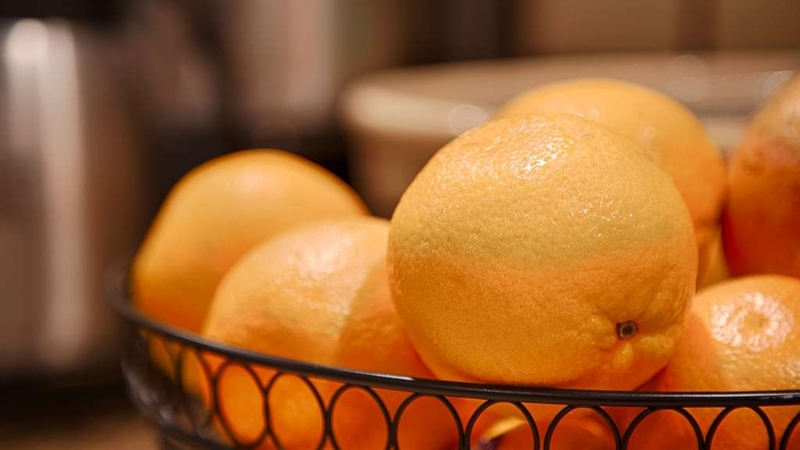 "Great Staff, Good Rooms, no Amenities"
Adrien on the front desk was very helpful during my 2 week stay. All staff is very friendly and eager to earn new and repeat business. Rooms are clean and comfortable. Not the best cable, but smart TV's in each room and was easy to connect to Netflix, Hulu, etc. 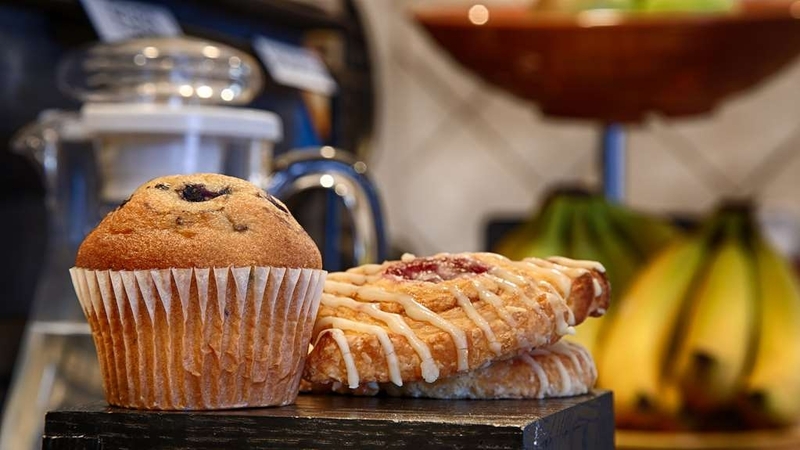 Continental breakfast is simple - oatmeal, cereal, waffle maker, apples and bananas, pastries, milk, coffee, juices, muffins and toast. The rates are the best in the area. No vending machine and no workout equipment, but there is a pool. 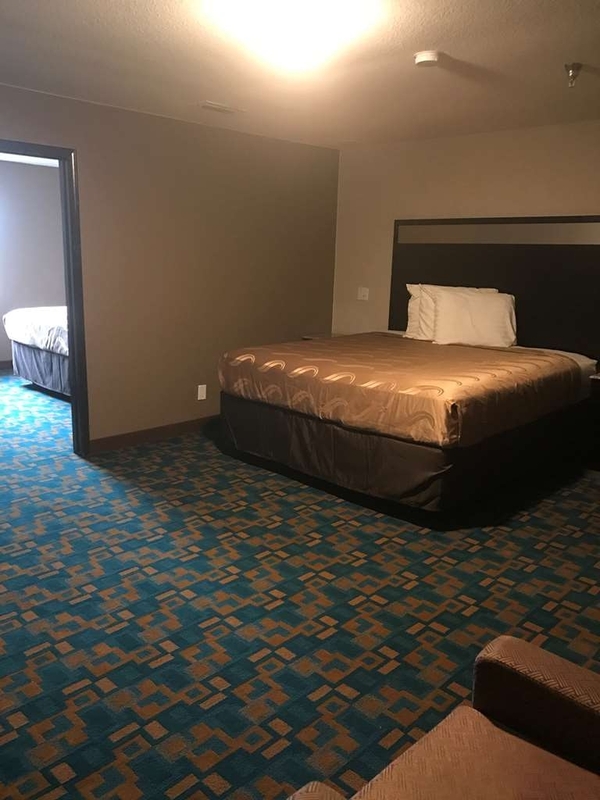 Clean remodeled place but lacks amenities others hotels in the area offer. We had to pay for children when most hotels offer their stay for free. "Continental Breakfast" lacked variety. No hot basic food was even offered. Housekeeper did not replace cups, no vending machines on-site but they sell bottled water by front-desk. Holiday Inn pricing with WAY less amenities and professionalism. Overall, I would not oppose staying there again ONLY if I do not find availability elsewhere. the place was recently renovated. it is clean, quiet and a bargain. 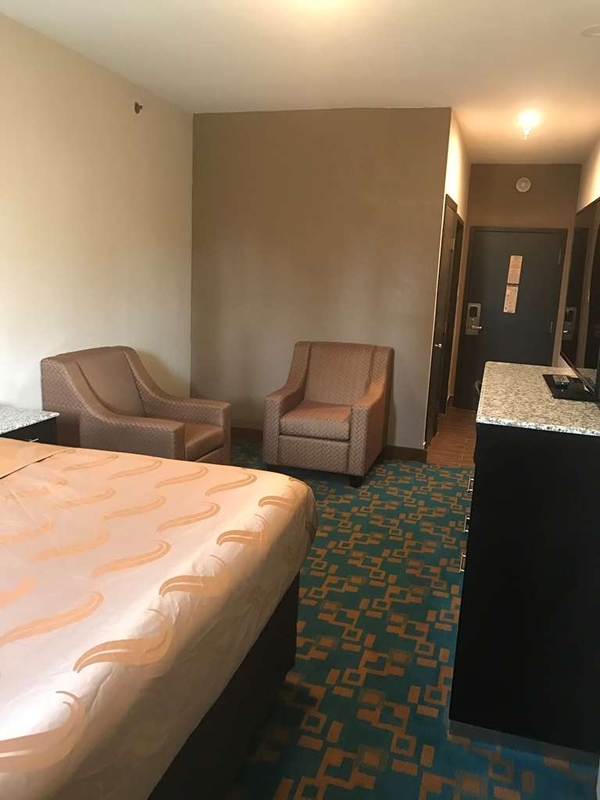 the staff was friendly and the mananger is super helpful with everything.. i have stayed here multiple times and would not choose anywhere else for the price. Pros: This motel was easy to get to, rooms are clean, has fridge and microwave, continental breakfast. Most of front desk staff where friendly and helpful. Price was good. Cons: The amenities are very basic. There is basic TV with 4 English speaking channels, there was no shade at the pool. Overall we felt it was a good place to stay for the price. "Nice place with friendly staff"
Not having GPS or a cell phone, it was difficult for me to get to i from South Padre Island, but once I got there the staff was very helpful to me with directions. There was only one place I wanted to visit-Oliveira Park for the parrots and it turned out that it was not too far from the hotel. My room was large and well appointed. Unfortunately their TV provider decided to switch from analog to digital the day I was there, so there was no TV available in the morning. We arrived around 5 pm and the desk lady was nice and helpful.The room was relatively clean but had a slight musty smell.The bed,in particular ,had a musty odor,but it was tolerable.The only really problematic thing for us was that there were no light fixtures anywhere near the bed.There were outlets with dimmers on both sides of the bed with tables,but no lamps,reading lights.etc.,so you couldn't read anything in bed if you wantd.There was a big ceiling light over by the TV on the opposite wall that lit up the back of any reading material you had,but cast a dark shadow over the printed side. Having said that,the place was as quiet as a mouse.We didn't hear any noise ever-which is very good.Also,except for the extreme low water pressure in the shower,the bath was nice and clean.Although we did not eat the continental breakfast,it looked very basic.The desk clerk did advise us well about nearby food options and was a pleasant as any we have encountered.Kudos to her. The motel is clean and quiet. The breakfast is minimal. The motel staff were great. The location is good. This is a no frills motel but good value. I would stay here again if staying in Brownsville or the area. "Friendly, clean and reasonably priced. Manager is wonderful!" I visited family in Brownsville, Texas from 1/18-1/22/2018. I found the hotel to be very clean and comfortable. The hotel has been remodeled in the past year, so it feels new. Bed was comfortable. No night tables or clothes hangers. I'm sure clothes hangers would have been provide d to me, had I ask Simona. Tradicional American breakfast included in the nightly rate, but no eggs of any kind. Box cereals, breads, yogurts, fruit, coffee. The staff was very friendly and accommodating. Simona, the manager was great. She was always responsive to my questions and helpful with suggestions. She has a great attitude! She arranged transportation for me to be picked up from the Harlingen airport and also to be taken back to the airport. I will stay there again next time I go to Brownsville. I recommend this hotel highly! It's a deal for what you get. The manager Simona is very personable, kind, she takes her job very seriously and she is always smiling.. ?? Mrs. Gomez, Thank you for your kind words my team and I appreciate the awesome review of our property. It was a great pleasure having you stay with us as well as getting you to and from the hotel safely. Your comments have definitely made my day. It is wonderful to know that our team's hard work and dedication is being noticed by those we care the most for. Your satisfaction is our utmost priority and based on your feedback, we see you were well taken care of. I do apologize for the hangers not being in place, you are absolutely correct if you had requested,I would had made it right. The SureStay promise to our guest is " If something goes wrong,we will make it right.You should feel Sure about your stay." We appreciate your recommendations to your friends and family, believe me when i say, there is no greater compliment. We hope to have the opportunity to welcome you back in your future travels to Brownsville. Great hotel!!! Super clean and very attentive to us as guest. They were extremely nice in the front desk and the place was very quiet and relaxing. The prices were very affordable compared to other hotels I shopped and the quality of this nice hotel is so worth it!!!! 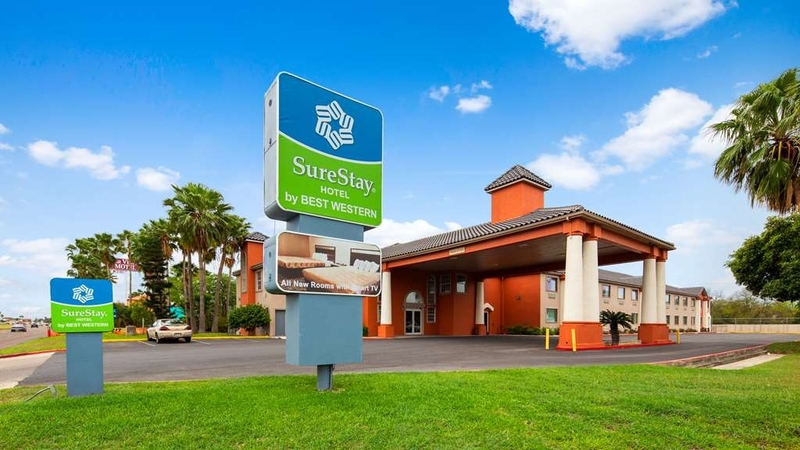 Thank you for choosing SureStay by Best Western in Brownsville. I have shared your comments with my staff and we are all delighted to hear you enjoyed your stay. My staff and I work very hard to meet all our guests needs, so therefore when we receive comments such as yours we know we are doing right by our guests. Once again we Thank you for your kind words and look forward to your next visit while visiting Brownsville. 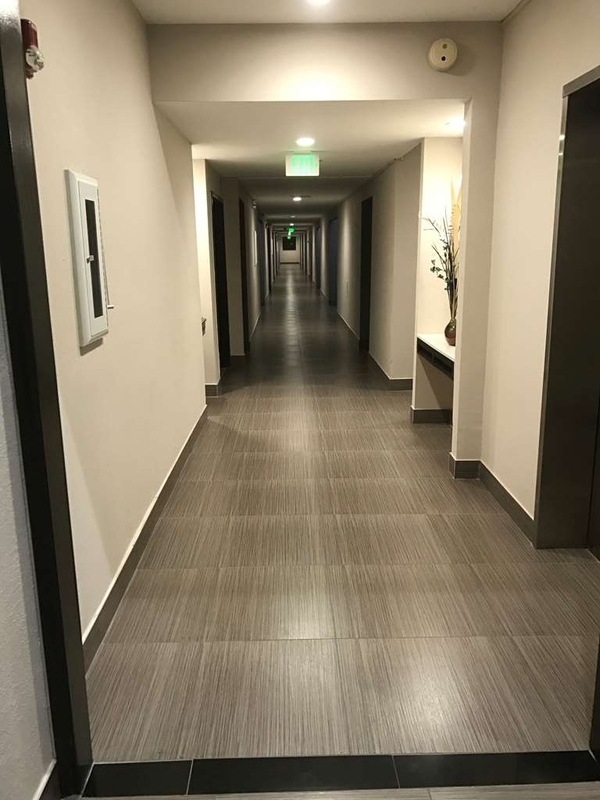 "Great stay for a great price"
The hotel is recently updated and very clean. Great stay, room was very clean and so comfortable. Staff was polite and helpful. The breakfast is great for picking up a quick bite before heading out for the day. It is close to the mall and the zoo, perfect location. 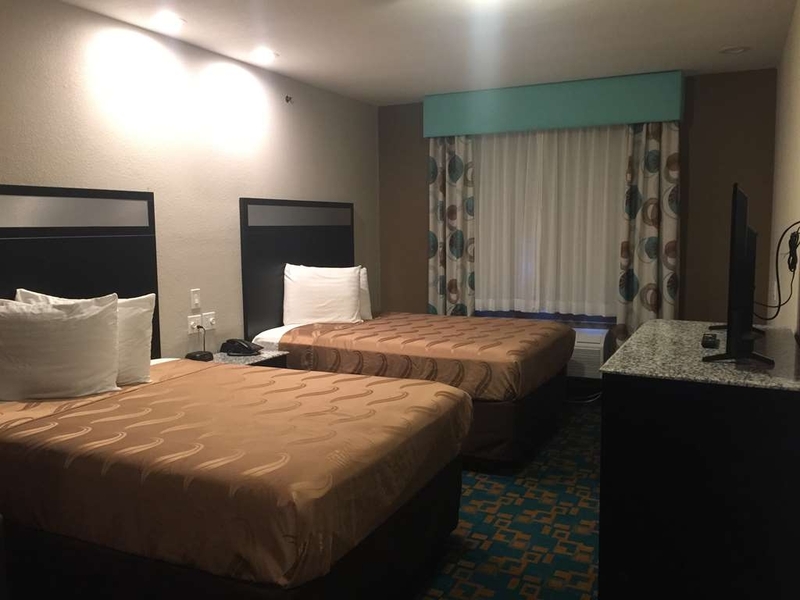 Thank you for choosing SureStay by Best Western while visiting Brownsville. We are delighted to hear you enjoyed your stay with us. Meeting all our guests needs is priority to my staff and I, so comments such as yours makes us happy to know our hard work is noticed. We look forward to serving you on your next visit to Brownsville. "Awesome place to spend with family"
From the time of check-in to the time of check-out, the staff was friendly and always smiling. 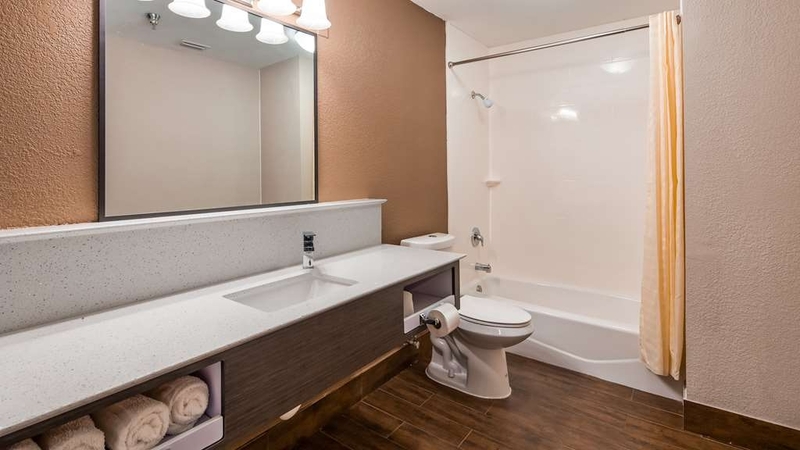 The rooms are in great condition, and the bathrooms are super clean. Beds are extremely comfortable and stain free which is a big plus for me. We had access to wifi and cable tv, which my children enjoyed. The pool was well maintained. Breakfast was delicious with variety of waffles, cereal, oatmeal, juice, milk and coffe. This was a great choice of hotel that my family and I chose to stay in. Great job to the management of this hotel! I love there hospitality, I really appreciate Simone's friendly greeting. This place is clean in everyway possible. I woke up for breakfast and they where cleaning a floor that was already clean. The rooms are spacious, very very clean, and comfortable. I sleep so good in thier king size bed. I enjoyed having cable, Internet and free breakfast. ..I was looking for a place that was cheap so we stayed at (Motel 6) the previous day , no breakfast, beds were dirty, and the roomed smelled. Then I found SureStay and for $13 more I got a real clean comfortable stay. .Omg if I never appreciated anything in life I honestly appreciate the friendly, clean , quite stay...thanks yall!!! !